Durham Ranch bison ribs right out of the smoker. Love the brawny taste of beef, but feeling a tad guilty about all that fat and cholesterol that go along with it? Then, take a taste of bison. Buffalo meat has much the same satisfying flavor, but with less fat and cholesterol, as well as fewer calories. Consider that a 3.5-ounce serving of choice beef has nearly 19 grams of fat, while the same portion of bison has just 2.42 grams. The bison also has more iron, B-12 and protein. I admit I’ve eaten far more beef than bison, simply because it’s easier to find in most stores. So, I jumped at the chance when Durham Ranch of Wyoming offered to send me some samples to try. The 55,000-acre ranch was started in 1965 by Armando Flocchini, a former butcher in San Francisco. It remains one of the largest bison ranches in North America. I tried the bison rib eye, which arrived in a huge roast that my husband, aka Meat Boy, deftly cut into 2-inch, nearly 2-pound steaks to grill. Although I do love my condiments, including all manner of sauces, when I’m eating good meat, I like to keep it plain and simple. That’s why I seasoned these steaks only with some sea salt before cooking it to medium-rare. Bison rib eye in all its juicy glory. Who wants a taste of this? 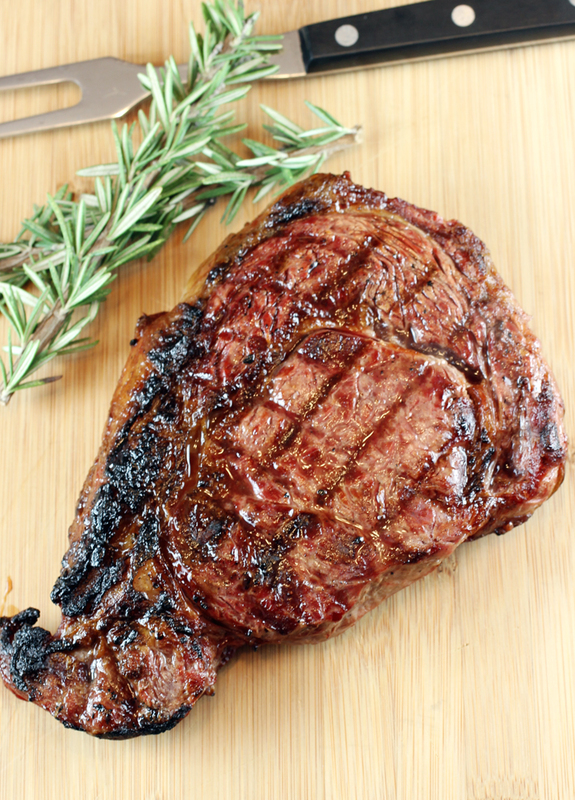 The Durham Ranch bison is grass-fed meat that’s finished on grain. Because of that, it was more tender than I expected. It’s not as flabby as a corn-fed beef steak in texture, but with more chew. There’s a complex minerality, and a wonderful natural, gentle sweetness to this meat. For the ribs, I went looking for a rub with some warm, musky, earthy flavors that would compliment but not overwhelm the meat. I found what I was looking for in “Steven Raichlen’s BBQ USA” (Workman, 2003) by master griller Steven Raichlen. My husband smoked the ribs in his Big Green Egg after applying the aromatic rub all over the 11-pounds of ribs. Talk about heaven. The bison ribs were less fatty than beef or pork ones, but delicious in their own right, especially with the rub that complimented the meat’s natural flavor. With a glass of Cabernet Sauvignon, it was a meal to remember. CONTEST: Two lucky Food Gal readers will each receive the same samples I did — a huge bison rib eye roast plus 11 pounds of bison ribs — all courtesy of Durham Ranch. Each prize is valued at a total of $170. Entries, limited to those in the continental United States, will be accepted through midnight PST March 12. The two winners will be announced on March 14. You’ve already read how I prepared and enjoyed my meat fest. Just tell me how you would most like to enjoy your ribs and rib eyes if you were to win. Best two answers win the two prizes. 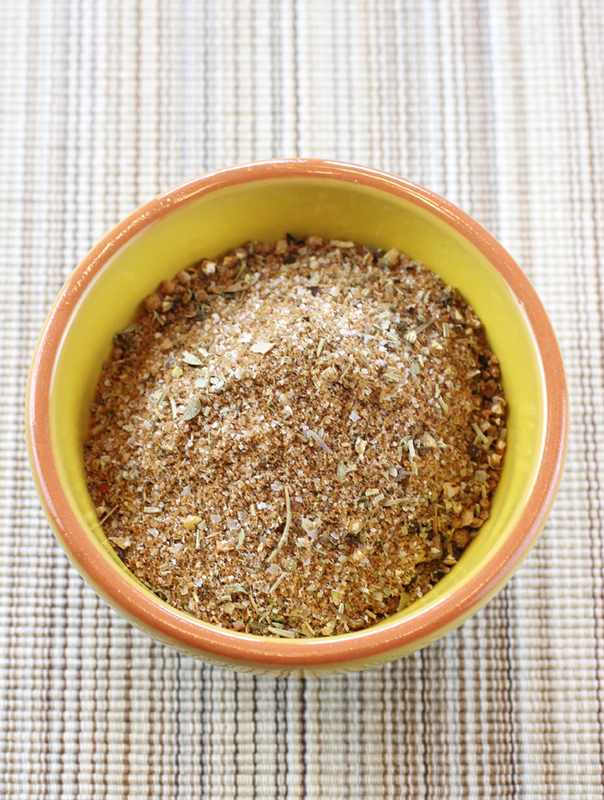 A delicious rub that would also be divine on chicken or pork. Crumble the rosemary between your fingers into a small bowl. Add the brown sugar, salt, pepper, cumin, oregano, and cinnamon to the rosemary and stir to mix. (Actually, your fingers work better for mixing than a spoon or whisk does.) Store the rub in an airtight jar away from heat and light; it will keep for several months. slow roast or grill them with a 5 spice, chile, brown sugar, garlic rub…finish with sauce of sambal olek,honey, cumin, coriander and soy….just to caramelize..
My first thought was “Wow, those cuts look incredible”. I’d most like to enjoy them with my dad and father-in law (ok, and husband) – I can hear the grunts of gastronomic pleasure!! ooh, ribeye! That would get a good sear on each side but leaving the center medium rare. Just a little salt and pepper would be perfect, but perhaps a garlic compound butter to finish it off! The ribs would get my friends super secret rub, the bonus being that since it’s super secret – he does the cooking. These are done on the grill are a perfect mix of sweet and spicy! I think I’ve only had bison as ground meat. I like the idea of bison, definitely sounds healthier. The ribs look good! I would sear them on a hot grill and cook to medium rare. I agree that all they would need in some salt and pepper! I would serve with roasted asparagus and truffled mashed potatoes. I would love to try buffalo and it would be great for my husband who has high cholesterol. Meat he could enjoy with out the worry of clogged arteries! I’m usually not a big fan of red meat, but holy Bison sounds delicious! I recently discovered Sirarcha Salt at Rainbow Grocery, what can go wrong with Sirarcha? Then I would serve this would roasted cauliflower and a fresh purple cabbage slaw on the side! So I’ve got 1.5″ cuts of bison rib eye? Let’s get it to room temperature first and get some sea salt rubbed in. A nice helping but not too much should do the trick. We’ll save the pepper for later since the plan is to sear it until it’s seared the way searers should. I’m not even sure that “searer” is a real word but oh well. After the salt, let’s slap some olive oil on it to make sure we keep the good stuff in. I know, some folks would rather put the oil in the pan but that’s them, not me. To each their own. With the pan hot and ready, just drop the steaks in. Let’s get a nice crust going by leaving it for about 3 minutes (per side). After the initial roar of the sizzle, let’s go ahead and get a healthy dose of pepper on it before flipping it. Medium rare…with a lovely crust with a simple and delicious amount of seasoning. I would love to try Buffalo Ribs and Ribeyes!! I think I would go with Kosher Salt and Black Pepper on the Ribeyes, and Kosher Salt, Black Pepper and Garlic Granules on the Ribs, maybe sprinkle of Cinnamon and ground coffee fo a bit of accent. This would be slow grilled over lump charcoal with some pecan chunks for some smoke. I would use a Chipolte rub on the ribeyes and I would slow cook the ribs with a BBQ sauce. That’s some meat that deserves glorious attention. Since the bison isn’t as fat as beef I think a dry brine would keep them especially juicy. 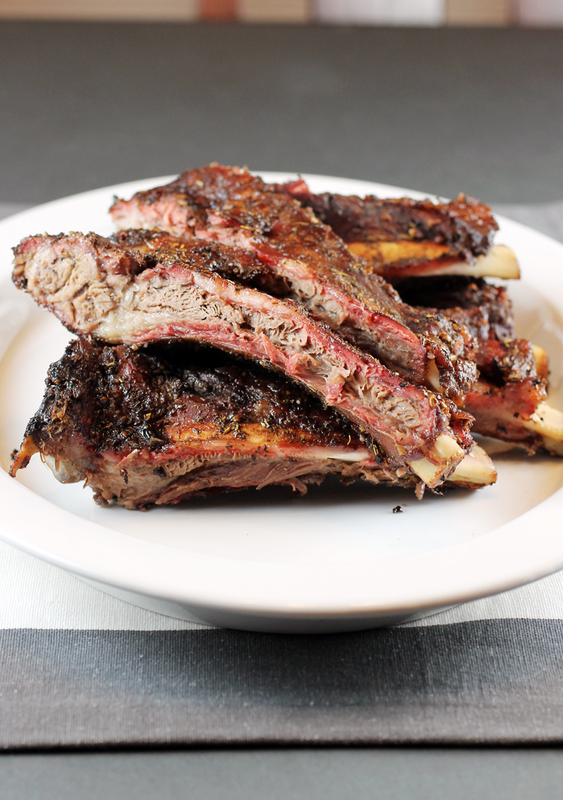 I’d take both the ribs AND the roast and dry brine them…24 hours of those delicious juices being locked in! Then take them out to let them come to room temp, adding a light dusting of rub before getting the royal treatment in our traeger smoker. The hours waiting for our meat would give time to prepare all the necessary sides to properly highlight the main course! I would put an Aussie ribbon them overnight then wet smile them. I first had Bison back in the early 90s on a business trip to Denver. I had a Bison burger, and while good it didn’t really wow me. Last fall when my wife and i bought a new larger crock pot for making bone broth, my wife was researching new recipes and came across a Bison stew recipe. She decided to make it, and added a 3-4 pd Bison roast to the shopping list. I cautioned her to say, I don’t know if Whole Foods would have it, her usual optimistic self was sure. Well, when i got to Whole Foods, I didn’t find any. I asked the butcher and he pointed over to another meat case, where there was ground Bison and Bison ribeye steaks, at $24.99 per pound. So I texted her and we decided just to get a alb steak to try it. When i got home we decided it was silly to make a stew with 1 lb of meat, so we decided to grill it on the green egg. I researched the best way to cook, and found out one should just salt & pepper – i added a dash of Worcestershire sauce (what doesn’t that improve?). I cooked it per instructions I had found. Well, it was one of the best pieces of meat we both ever had. We have had it several times since, and I even cooked it for some friends while visiting them in Denver/Winter Park a few weeks back. As for what I would do with the sample pack. Well, for the steaks I would stick to what has worked so well. With meat this good, there really isn’t anything that it needs. Just cook it on the Big Green Egg and enjoy. But for the ribs I think I would experiment a little. I think I would split them up into 3 or 4 pieces and try different rubs. One would be my tried and true rub, one I have used for many years and can make it blindfolded. I think since there is a little sweetness to Bison that a good jerk rub might be really nice so I would jerk a slab section. A third I would use a mustard based rub/mop, and the fourth I would do a cumin/chile rub with a tamarind glaze. My mouth is watering just thinking about it. A simple garlic salt and pepper rub for the rib eye steaks to allow the purity of the steaks’ natural flavor to sing through. 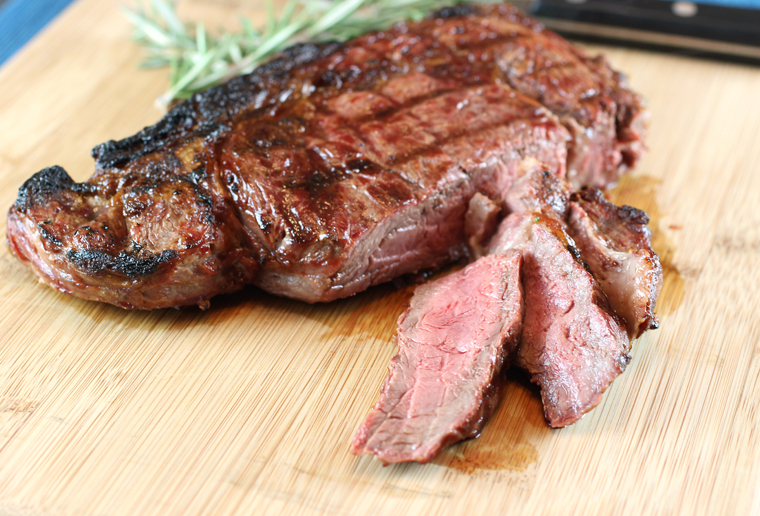 Throw on a hot grill for a crunchy sear until cook is medium-rare. For the ribs, I would steam them first to tenderize the meat, marinate with a melange of spices, roast in the oven, and finish on the grill for crunchy bits. I would enjoy with my husband, sons, and parents in our backyard – accompanied by a bright green salad and roasted root vegetables, including golden beets which I have newly discovered. Bison! I love coming across ingredients I have not tried. I love expanding my palate as well as my kitchen skills. Hmm for the roast i would also slice them and then use a rub of brown sugar, ginger, tarragon, cinnamon and garlic. It’s my go-to for lamb and a family favorite. I sold my son on it when he was two and he still loves it! For the ribs, I’d try something a bit more adventurous. I recently made baby back ribs with kalbi marinade and it turned out so well! And I’m a kalbi purist! So seeing how that went, I’d be really curious to see how bison would stack up to the kalbi marinade. Definitely not your standard barbeque but could be a really interesting mix! My friend has an outdoor smoker, so I’d definitely ask to use it to slow cook the ribs over hickory wood chips with a dry rub of cajun seasoning. I’d make it a mini cookout, along side some grilled pineapple, homemade coleslaw with an apple cider vinegar/dijon mustard base instead of mayo, and some grilled veggie kabobs. A good red wine to go with it all. Yum! Hello, Spring! I have seen this sauce used so many times, I have just never taken the time to make it! After cooking the “Primer on Prime Rib Dinner” (and the 2.0 and 3.0 incarnations), my biggest takeaway from cooking many, many rib eyes is that the cap is wonderful meat that can (and I would argue should) be treated totally separately from the rest of the Rib Eye. The ribs are delicious, and the eye is a great cut as a “mini Roast”. I always look for the “least trimmed” Rib Eyes, so that wne I butcher them it’s easy and I have good scraps. I have some pulled buffalo ragout in my freezer. I would use it as the filling to make Buffalo “Croque Wyoming” as an appetizer. I would cook the ribs sous vide for 48h at 57C and finish them in a convection oven with a glaze made from the reduction of the natural jus. The meat and collagen would still be intact (and turned into gelatin), so I’d be able to carve off nice chunks of meat. I would marinate the cap in green garlic and herbs and then cook it on the plancha like a flank steak. I would render the fat and make Yorkshire puddings to eat with the sliced cap meat. I would render the scraps and make rye scrapple as a garnish for the eye meat. If I won, I would enjoy the meat cooked for me ha ha. My friend is an awesome cook so I would give him meat in exchange for his grilling magic. I like Bobby Flay’s coffee rub ribeyes. As for ribs – smoked then covered in spicy BBQ sauce. I love my rib eye’s seared in a smoking hot cast iron pan with just salt and pepper, I see no better way to eat a rib eye. I love rib-eye’s so much I created a special rib eye cooking station in our backyard, since we live in a smaller house with a weak exhaust fan, we had to find a way not to fill the whole house with smoke and set off the smoke alarm every time I made a steak. So outside I have a portable induction stove setup with a thick cast iron pan, I let the pan get super hot and smoking till it worries anyone watching me cook, then I sear all my steaks in to a crispy perfection. I would do the same for this Bison rib eye and enjoy every last bite of it, quick and simple. For the ribs, I’m a firm believer of low and slow, which is a lot more time consuming than the rib eyes. I would marinate the ribs overnight in dry rub of paprika, brown sugar, and salt and pepper. Then I would steam them in tight tin foil patches for 2-3 hours at a low temperature so the meat is nice and moist, but still has a little bit of bite on it. I would finally finish it on the grill with a sweet glaze from the drippings from the oven, ketchup, maple syrup and some red wine vinegar boiled to a sticky delicious glaze. The ribs would be grilled quickly on each side so the ribs have a nice char to it and the sticky glaze is evenly coated. Typing this up makes me want to eat some right now, and get my hands and face messy with some bison goodness. I would love to get my hands on some Bison and try out my tried and true ways.